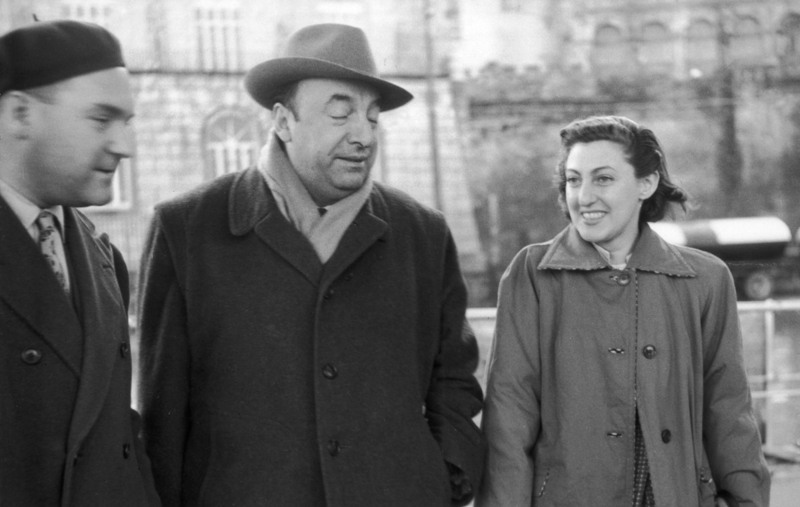 Book News: Neruda's Death? Experts Say The Assassin Didn't Do It : The Two-Way Also: Leon Panetta is writing a book; Alexander McCall Smith buys some islands. Chilean poet Pablo Neruda arrives in Capri, Italy, in 1952. An investigation into the death of Chilean poet Pablo Neruda took a strange turn this week as investigators' focus shifted to an American named Michael Townley, who was an assassin for Chilean dictator Augusto Pinochet and a rumored CIA double agent. It's suspected that Neruda, who was an ally of deposed President Salvador Allende, died of poisoning, and his body was recently exhumed for testing. Dr. Sergio Draper had initially claimed he was with Neruda when he died, but now says another man — referred to as "Dr. Price" and possibly matching Townley's description — also was involved. A Chilean judge ordered the police to find the mystery man. But Townley, who is currently in the Witness Protection Program, was likely in Florida at the time of Neruda's death, according to experts interviewed by The Associated Press. John Dinges, a reporter who covered Chile for The Washington Post and wrote two books on Townley, told the AP that receipts, a driver's license and a passport place Townley in Florida at the time of Neruda's death. Peter Kornbluh, the author of The Pinochet File, a Declassified Dossier on Atrocity and Accountability, agreed, telling the AP: "We all want to see this case solved, but false leads are not going to bring us any closer to arriving at the truth of Pablo Neruda's very untimely death." For Tin House, Chimamanda Ngozi Adichie speaks with Parul Sehgal about race, hair and Americanah, her latest novel: "I wanted very much to write an honest book. I knew I could have done it differently, in a way that was safer. I know the tropes. I know how race is supposed to be addressed, but I just wanted to write the kind of novel about race that I wanted to read." The first day of the Apple ebook price-fixing trial yielded little new information. The Justice Department continued to argue, as it had in pre-trial statements, that Apple conspired with five major publishers to set ebook prices, while Apple insisted that "the government has reverse-engineered a conspiracy." Alexander McCall Smith has bought a chain of islands off the coast of Scotland. The author of The No. 1 Ladies' Detective Agency books bumped into the islands on a sailing trip with his wife. In a feature called "What I Read That Summer," The New York Times asks writers like Louise Erdrich, Junot Diaz and Cheryl Strayed about summer reading experiences. Author Chelsea Cain describes using $20 bills that she found washed up on the beach as bookmarks: "It was many years later that I realized that my windfall of floating cash had not been lost by careless swimmers, but instead dumped by smugglers about to be boarded by the Coast Guard. By then it was too late. I had already filled the library's collection of Nancy Drew books with drug money." Former CIA Director and U.S. Defense Secretary Leon Panetta is writing a book with Penguin Press. In a statement quoted by The New York Times, Panetta said, "My goal is to give readers the opportunity to go behind the scenes and learn the lessons of how our democracy works, and sometimes how it fails to work." Panetta is only the latest former member of Obama's Cabinet to write a political memoir: Hillary Clinton and Timothy Geithner also have books in progress. The latest tired "Criticism Is Dead!" op-ed (not to be confused with "The Book Is Dead!") comes from author Clive James in a New York Times essay called "Whither the Hatchet Job?" He writes, "America can't do the bitchery of British book reviewing and literary commentary."